Relevance Ubiquitylation is a highly diverse and complex post-translational modification for the regulation of protein function and stability. Studies of ubiquitylation have, however, been hampered by its rapid reversal in cell extracts, for example through the action of de-ubiquitylating enzymes (DUBs). 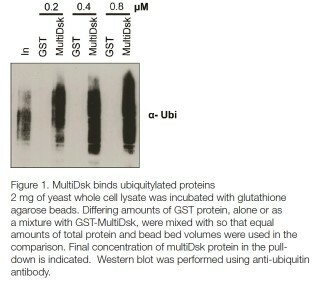 MultiDsk is a novel ubiquitin-binding protein reagent and is composed of an array of five UBA domains from the yeast ubiquitin-binding protein Dsk2, fused to GST. 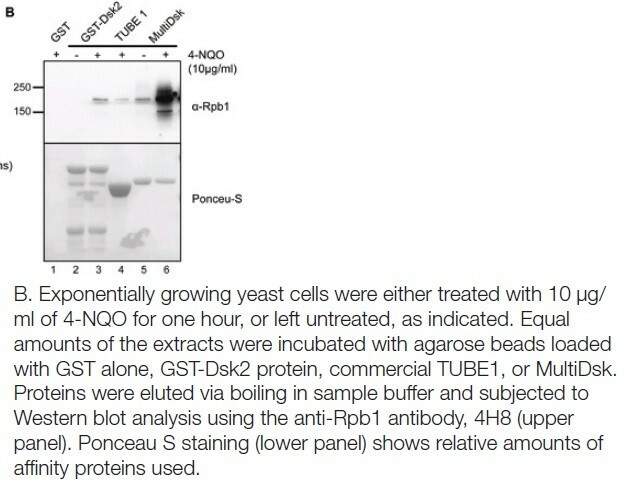 MultiDsk binds ubiquitylated substrates with unprecedented avidity, and can be used as both an affinity resin to study protein ubiquitylation, and to effectively protect ubiquitylated proteins from the action of DUBs and the proteasome in crude cell extracts. 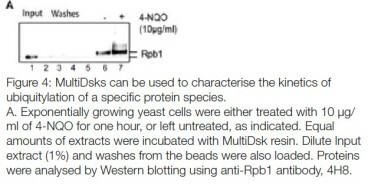 MultiDsk offers the opportunity to obtain pure, native, nontagged, ubiquitylated proteins from cell extracts whilst helping ensure the maintenance of the normal ubiquitylation state via a strong protective function, inhibiting de-ubiquitylation. 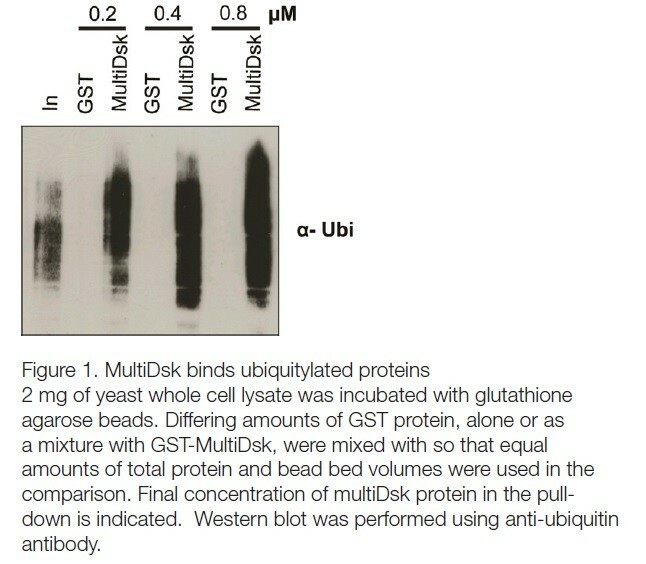 Notes This novel high-affinity ubiquitin-binding protein reagent binds with higher affinity than any other ubiquitin-binding reagents we have tested. 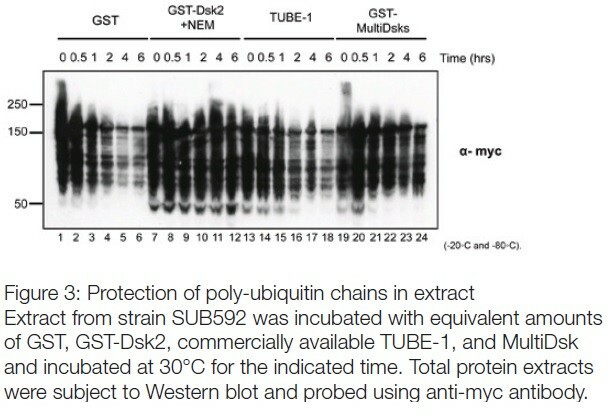 MultiDsk can be used to selectively enrich native ubiquitylated proteins and to protect these from the action of DUBs. The resin can also be used to efficiently purify both mono and poly-ubiquitylated proteins. 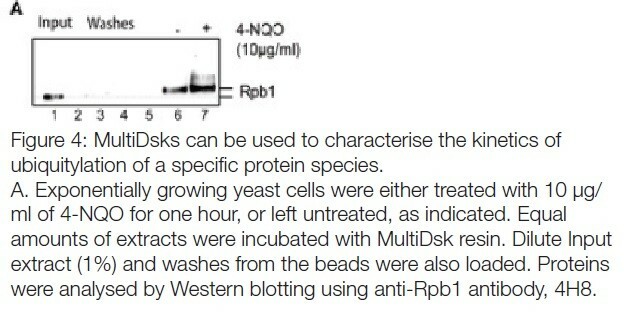 MultiDsk can be used to identify novel ubiquitylated species. 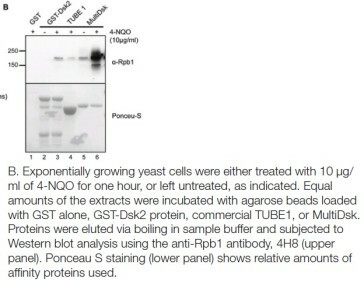 MultiDsk provides a significant protective role at concentrations as low as 0.2 μM, making it suitable for use in even large-scale extract experiments, especially because large quantities of the protein can easily be produced in E. coli. Emmerich et al. 2015. Biochem Biophys Res Commun. :. PMID: 26325464. 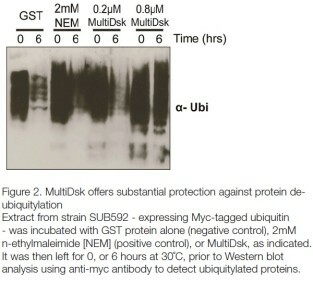 Optimising methods for the preservation, capture and identification of ubiquitin chains and ubiquitylated proteins by immunoblotting. Wilson et al. 2013. Cell. 154(5):983-95. PMID: 23993092. 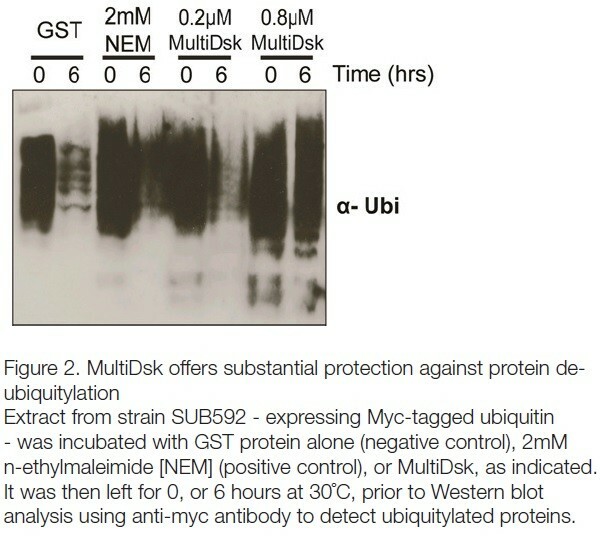 MultiDsk: a ubiquitin-specific affinity resin. Wilson et al. 2012. PLoS One. 7(10):e46398. PMID: 23056298.